First Thus publication by J.M. Stoddard and Co, with an introductory essay by Henry Coppee, President of Lehigh University. I can't see an author, per se, identified on title or other page. 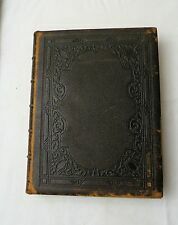 BEAUTIFUL LEATHER, "Richly Illustrated with nearly one hundred fifty steel engravings, produced in the finest style of the art, mostly from original designs by distinguished artists.". Ounce Dice Trice. Drawings by Ben Shahn. Signed by Ben Shahn on front free endpaper. by Alastair Reid. First Edition. Illustrated by GEORGE GROSZ. 1944 HARDCOVER W/ SLIPCASE. 295p.,very good, 298 illustrations by Emil Orlik, book design alsoby Emil Orlik. 5 Books German Art Nouveau Emil Orlik Design Lafcadio Hearn 1st ed. Übersetzung aus dem Englischen von Berta Franzos. Illustrator: Lynd Ward. GODS’ MAN: A NOVEL IN WOODCUTS. Ward, Lynd.GODS’ MAN: A NOVEL IN WOODCUTS. New York: Jonathan Cape and Harrison Smith, 1930. Publisher: Jonathan Cape and Harrison Smith. Cloth-backed with printed paper-covered boards and spine label; less edgewear than usual with this book; book has a slight forward lean; the contents are very clean and bright, free of any previous owner marks of any kind. Maurice Leloir is considered a historical painter, watercolorist, engraver, illustrator, playwright and film producer. He was born in Paris on the 1st of November 1851 and died on the 7th of October 1940. Inscribed by Painter Maria Piedad Larrain. IV Centenario de la publicación de La Macha. Spanish Language Book - Santiago Chile. Swiss Family Robinson - Profusely Illustrated Rare Antique Literature Book. Year printed is unknown. Published by W.B. Conkey Company. Pocket sized hardcover. 185 pages. Shelf wear, age coloring and some dirt. Pencil writing on inside cover page. Tears to a couple inside cover pages. Binding starting to loosen but still holding on. See pictures. Shipped with USPS Media Mail. Illustrated by Rowland Wheelwright. Illustrator: Rowland Wheelwright. Dickens, Charles. A TALE OF TWO CITIES. Publication Date: 1925. Rackham, Arthur (Illus); Barrie, J. M. (Author). Green cloth with color pastedown,, light shelf wear, faint stain to rear cover, gilt slightly dulled. A smaller edition of Rackham's most celebrated work with 16 color plates. MR. DEATH AND THE REDHEADED WOMAN. But, a red-headed gal intercedes and Mr. Death spares Billy's life. Throughout the story, the redheaded woman admires and falls for Mr. Death. by Helen Eustis. The original title was THE RIDER ON THE PALE HORSE. CANTERBURY TALES. ILLUSTRATED BY ROCKWELL KENT. IN MODERN ENGLISH BY J.U. NICOLSON. GARDEN CITY. Printed on luxury paper, extensive wear, soiling, and heavy marginalia throughout. Illustrated throughout with woodcuts by Guyot. Text in French, else in good condition. Illustrations en couleurs de Guyot. First Thus publication by J.M. Stoddard and Co, with an introductory essay by Henry Coppee, President of Lehigh University. I can't see an author, per se, identified on title or other page. BEAUTIFUL LEATHER, "Richly Illustrated with over one hundred steel engravings, executed in the highest style of the art, mostly from original designs by eminent artists.". THE ADVENTURES OF HAJJI BABA OF ISPAHAN. Illustrated by Cyrus LeRoy Baldridge. New York: Random House, MCMXXXVII (1937). [xxiv], 403,  pages. Bound in three-quarter polished calf and marbled paper over boards, fillet borders on sides. London, New York, R. Tuck & sons, c1898. 24 color chromolithographic plates, signed in plate. Burgundy cloth boards with embossed letters and characters with gilt. The rarer issue, there is no image of Dickens on the cover. Here is a recent estate find. This is a Rare Antique Victorian Book with Color Illustrations Entitled "Through The Year With Longfellow", published by Boston: Dewolfe, Fiske & Co. This is in Overall Good condition, as pictured, with Normal Wear From Age! Clean, odor free copy. 1977 Hardcover. Published by The Peter Pauper Press Inc. Number of pages: 32. Cervantes, Miguel. edited by J. W. Clarke, Illustrated by Gustave Dore, Biographical Notice by T. Teignmouth Shore.The History of Don Quixote. The Hogarth Press, 1930. The Book Rack. Text is tight and clean. Appears unread or barely so. A few small spots of very light rub to the gold background on the front board, but other than that, this is a beautiful copy. Neat previous owners' bookplate to the verso of the front fly-leaf. Kate Seredy was a Hungarian-born writer and illustrator of children's books. Dust jacket now. Housed in a clear cover. Tinted top page edges, text and illustrations remain bright and clean, binding is secure, a scarce well. Sigmund Abeles was born 1934 in New York City and raised in South Carolina. (sigmundabeles.net). New York, Limited Editions Club, 1974, hardcover with publisher's slipcase. This is numbered copy 1806 of 2000. 1856 GEORGE CRUIKSHANK illustrated "THE WORKS OF HENRY FIELDING"
(Cruikshank, George). Fielding, Henry.THE WORKS OF HENRY FIELDING. London: Henry G. Bohn, 1856. Thick octavo, red cloth titled in gilt between gilt rules on red cloth labels on the spine. The binding is lightly bumped & rubbed and the labels are chipped. Wyeth, N. C. (Illus); Fox Jr, John (Auth). TEG with deckled edges. Cloth boards with vellum spine titled in gilt, one plate with tiny abrasion at top edge else fine and clean. Limited to 512 copies, signed by Wyeth. By Mitchell S. Buck. Philadelphia: Nicholas L. Brown, 1918. BOOK REPAIR AND RESTORATION. Wrinkled production flaw to the front pastedown endpaper, else near fine in purple cloth with paper spine label. Ferdinand Raimund Der Diamant des Geisterkoenigs. Artist Alfred Hagel – Numbered edition and by Alfred Hagel signed copy printed. Alfred Hagel. Alfred Hagel (Wien 1885-1945). Verlag, 1920-72 pp. 23.5 x 18 cm. Author: O'Brien, Sean and Aris, Birtley. Poems & Drawings. First Edition. One of 150 numbered copies signed by O'Brien and Birtley on the second flyleaf. A most original book of poems in the form of a travel sketchbook "in the tradition of John Piper and Eric Ravilious", by the prizewinning author of the previous collections - among them THE DROWNED BOOK (2007). 1926 London. Laurence Binyon. The Engraved Designs of William Blake. Ernest Benn, London, first edition, 1926. (First UK Edition). Damping near spine to first pages ca 1/3 from lower edge. Foxing to endpapers, first pages and several pages. The Illustrated Treasury of Children's Literature. edited by Margaret E Martignoni. Illustrated with original pictures by 85 world-famous artists. I am not sure when this was printed - it is not a first edition because it has solid colored endpapers whereas I think the first edition had decorated endpapers. Harte, Bret. Luck of Roaring Camp, and Other Sketches. Collection of stories originally published in 1870 including title story; Outcasts of Poker Flat; Miggles; Tennessee's Partner; Idyl of Red Gulch; and Brown of Calaveras. This work is essentially three illustrated poems. Which follow in a Romantic, Tragic fashion. She is writing to her lost love, from "Poverty Flat.". To rekindle their romance?. The second piece is that of the Lover's reply. Binding a bit shaken but pretty good still. Limited Editions Club, London, 1938. Andre Derain and Aubrey Beardsley (illustrator). Of a total edition of 1500 copies SIGNED by the artist on the colophon page #1388. Both books Housed in a maroon hard case.